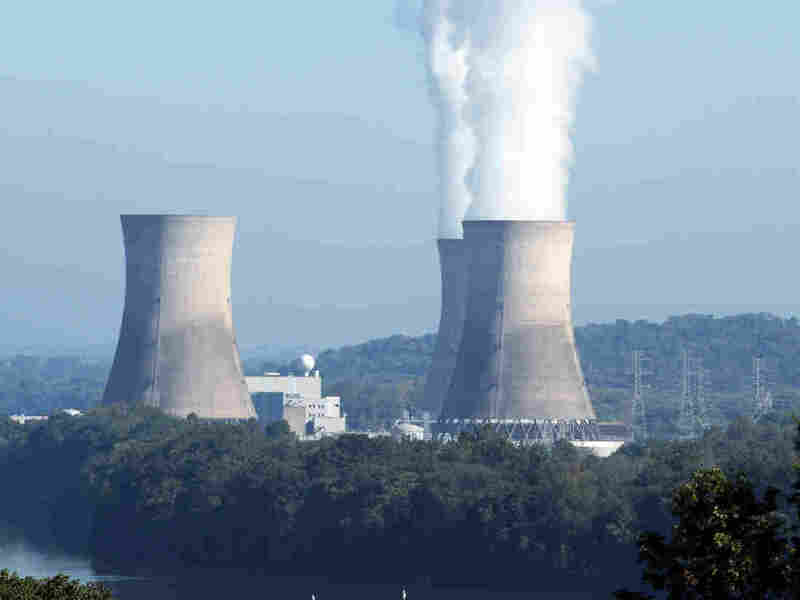 The Three Mile Island nuclear power plant, in Londenderry Township, Pa., was the site of a partial meltdown in 1979. The plant, with its one still-functioning reactor, is having trouble selling its power because it's more expensive than other resources, including natural gas. Unable To Compete On Price, Nuclear Power On The Decline In The U.S.
"Nobody's in the mood for a bailout," says anti-nuclear activist Eric Epstein, as he considers where to put up a poster in the Amtrak station in Harrisburg, Pa. It has the iconic image of Uncle Sam pointing at the viewer, and saying, "I want you to stop the bailout of nuclear power in Pennsylvania." Epstein has been a nuclear watchdog since 1979, when one of the reactors at the nearby Three Mile Island plant partially melted down, bringing the industry's growth in the U.S. to a standstill. Four decades later, Epstein says nuclear power is just too expensive, and he doesn't want his state to do what New York and Illinois already have. Both states recently agreed to give billions in subsidies to the nuclear industry by essentially broadening the definition of clean power. Supporters say the move will help combat climate change, since nuclear plants don't emit carbon. "The system we have today is designed around 'How do I deliver the cheapest megawatt-hour of electricity in the next hour?' says John Kotek of the Nuclear Energy Institute, "without reflection of the environmental impacts, for example or the importance of fuel-supply diversity, or reliability." Around the country, five nuclear plants have retired in the past five years, and another five are scheduled to close within a decade. In Pennsylvania, the Three Mile Island plant — which still has one functioning reactor — is having trouble selling its power because it's more expensive than other sources, like natural gas. But the bailouts are facing opposition from those competing power producers, especially the booming natural gas industry. "We are not anti-nuclear," says Stephanie Wissman, head of the Pennsylvania division of the American Petroleum Institute. Her group is part of a new coalition opposing nuclear subsidies, a coalition that includes gas trade groups, manufacturers, and the AARP. They argue the subsidies are unfair, and will lead to higher energy bills. Wissman says nuclear plants are "an important part of the energy mix. However, they've got to play by the same rules as every other energy source." The debate has put environmental groups in a tough spot, and left them divided. Climate change is a big priority for many of them, and they've traditionally supported subsidies for renewables. But Jackson Morris, of the Natural Resources Defense Council, says nuclear power is neither clean nor renewable. "We do recognize that it does have low-carbon attributes," he says. "But it's by no means on the same playing field as truly renewable resources, like wind, solar, and energy efficiency." NRDC has been willing to go along with some nuclear bailouts, but only when they also included more support for renewables. 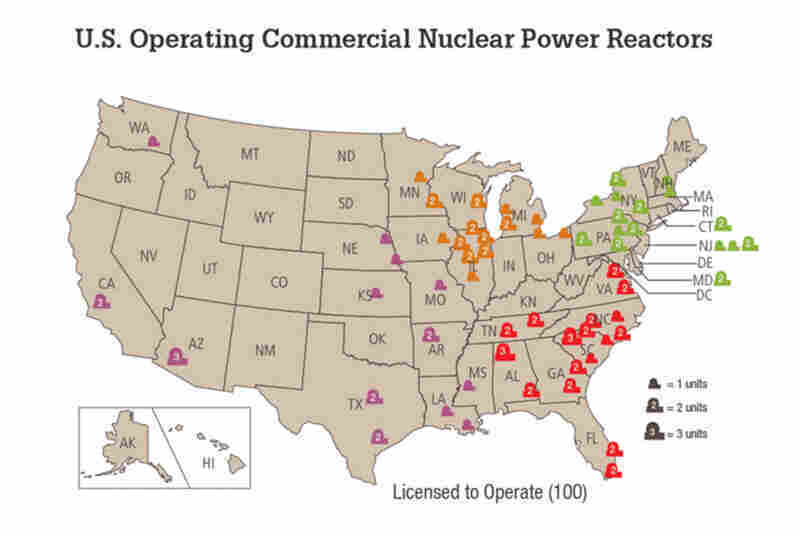 The nuclear industry has ramped up lobbying efforts in several states, including Ohio. There, after hours of testimony, lawmakers put off a vote, according to the Cleveland Plain Dealer, saying the proposal to charge customers more to help nuclear plants did not seem likely to pass. The research and advocacy group Environmental Progress had spearheaded support for the Ohio measure, even appealing to the online shopping giant Amazon, a large employer in the state that has been outspoken in its support for renewable energy. In a joint letter to the company's owner, Jeff Bezos, scientists, business and community leaders wrote: "If Ohio's nuclear plants are allowed to close they will be replaced overwhelmingly by coal and other fossil fuels." In New York, a group of opponents are challenging the subsidies to nuclear plants, saying they have "the potential to unravel U.S. power markets altogether." Marie Cusick reports for StateImpact Pennsylvania. NPR's Jennifer Ludden contributed to this report.